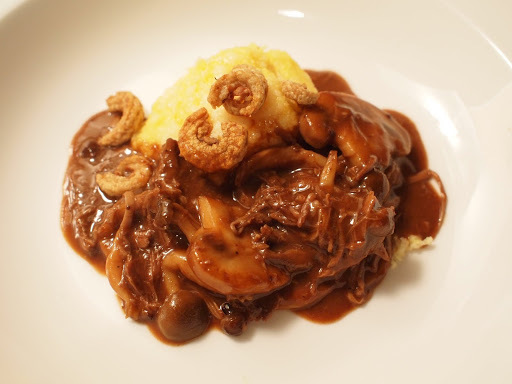 This is a recipe I entered for the Scharffen Berger Chocolate Recipe Contest last year… The duck skin cracklings look a little weird but the duck ragu with chocolate was actually really good. Went well with the taleggio in the polenta. 1. Remove the breast and thigh from half the duckling and also remove excess fat. 2. Cut up the bones into a few pieces. 3. Heat the extra virgin olive oil in a small rondeau and sear until golden brown on all sides. 4. Remove the bones and set aside. 5. Deglaze the pan with the onions, carrot and celery (add a little bit of water if necessary) and lightly brown. 6. Add the bones back to the rondeau and pack tightly. 7. Add enough water to cover everything by an inch. 8. Simmer for 4 hours and skim the fat and skum once in a while. 9. Drain and cool over an ice bath if not using within 4 hours. 2. Season the duck breast and thigh with salt and pepper. 3. Heat the extra virgin olive oil in a small rondeau on high heat. 4. Sear the breast and thigh on both sides until golden brown. Remove and set aside. 5. Turn down the heat to medium and add the onions. Deglaze the pan and cook the onions, garlic and ginger until lightly brown (add a little bit of water to prevent burning). 6. Add the tomato paste and cook until rusty brown. 7. Deglaze the pan with the wine and reduce until syrupy consistency. 8. Stir in the paprika, dried chili, bay leaf, thyme and dried mushrooms. 9. Place the breast and thigh back in the pan. 10. Add enough duck stock to cover approximately ¾ of the breast and thigh. Stir lightly to incorporate the stock and other ingredients. 11. When brought back to a simmer, place a tight lid on top and put the rondeau in the oven. 12. Braise for 2 hours or until the meat is fork tender. 13. Remove the duck from the braising liquid, shred into bite size, and keep covered and warm. 14. Strain the braising liquid into a small sauce pot through a chinois or sieve and squeeze excess liquid from the onions. 15. Heat the extra virgin olive oil in a medium sauté pan over medium heat and sauté the mushrooms. Season to taste. 16. Sprinkle the flour over the mushrooms and mix in well. 17. Add the braising liquid and simmer for at least 15 minutes. 18. Add the chocolate, cocoa and raw honey, and stir well with a wooden spoon. If the sauce seems too thick, add a little more braising liquid. 19. Add the shredded duck and season with salt and pepper if needed. 1. Bring the duck stock and water to a boil in a small sauce pot and add the salt. 2. Sprinkle the polenta into the water and stir with a wooden spoon. 3. Turn down to low heat and stir in the Taleggio and Parmigiano Reggiano. 4. After five minutes and the cheese has melted fully, scoop the polenta onto a sheet tray lined with parchment paper (use a palate knife or wooden spoon to flatten it out to desired thickness). 5. Pre-heat the oven to 350 degrees. 6. Cool long enough for the polenta to become stiff enough to cut into desired shape. 7. Cut the polenta (into four portions, any shape) and place on a parchment paper lined sheet tray and place in oven until light brown or just heated through. 8. Serve with the duck ragu.